At Best Taste Place: Carbon Steel Wok is the best, why? Bring Eastern Cooking Equipment Into Western Home Kitchen. The Wok is the traditional Chinese cooking tool and has been for a long history. It is both economical and practical. Carbon steel wok is the best tool for stir-frying foods, or any Asian food. Best for deep frying, boiling, steaming, Stewing, braising and roasting seeds and nuts. The wok conducts heat evenly and quickly. And it’s very easy to take care of. Easy maintenance to season and clean makes the wok my favorite cooking pan. A well seasoned and cared for Wok will prevent it from rusting. Don' soak or run cold water over a hot wok right after cooking. If you need continue to cook another dish, just use a paper towel or brush to clean out the food particles from the Wok. How to Buy? 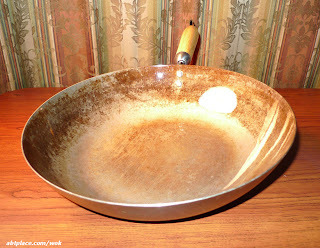 Choose a Flat or Round bottom Wok. Choosing to use a flat or round bottom steel wok depends on your cooking range. Flat or round bottom woks can be used on gas stoves. If you have a flat top electric range, then the best choice is to use a flat bottom wok to avoid any damage to the flat top range surface, and it is also easy to heat it evenly. For a round bottom Wok, it is best used on gas stoves as it can get maximum heat from flame to Wok. For myself, I like the flat bottom Wok, because it is much more secure and steady on the cooking range.